Tucking your CCW pistol into your waistband is a fast, easy way to conceal your firearm without adding the bulk (or expense) of a holster. However, this style of so-called “Mexican carry” is not without its issues. The first concern is safety, as it generally leaves the trigger exposed and could spell trouble if your finger or some other object inadvertently gets inside of the trigger guard and onto the bang switch. If you choose to tuck your pistol into your belt, to pocket carry or to use some other method that does not shield the trigger, be aware of this and exercise appropriate caution to prevent a dangerous situation. The next issue with having a gun just stuffed into the waist of your pants is that it relies on the pressure between your belt or pants and your body to hold the pistol in place. This is all well and good if you’re not being particularly active, but throw some motion into the mix and your carry piece could shift around into an awkward position or even slip down your pant leg (Plaxico Burress, anyone?). For some time KelTec owners have enjoyed a beautifully simple improvement over simply cramming a loaded firearm into their pants: a small clip that mounts to the frame of the gun to hold it in place. Unfortunately this hasn’t been an option for owners of many other firearms. Until recently. 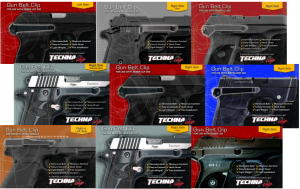 We got a chance to talk with Emily from TechnaClips at SHOT Show 2014, where they were showcasing their product that adds this convenient carry option to a number of firearms, including Glock, Sig Sauer, Ruger, Smith & Wesson and Springfield . Using a clip like this, the pistol is well concealed deep in the waistband and if someone does spot the clip , it looks a lot like a pocket knife clip. It is also quick to put on and take off without fooling with a holster or taking your belt halfway off, so CCW-ers don’t have an excuse not to be armed on quick trips to the store or a impromptu stroll around the neighborhood. As long as the wearer is cognizant of the exposed trigger and exercises proper caution, this seems like a great method to carry. This is less of an issue for pistols like the KelTec which has a heavy DAO trigger pull a mile long but it is something to keep in mind when carrying other pistols with triggers that are easier to manipulate. Another quirk about the TechnaClip comes on the Glock and Springfield XD models: whereas the clip attaches to the frame of most supported firearms, it attaches to the rear of the slide on these two models. This yields only a small attachment point to support the full length of the clip, which makes racking the slide somewhat awkward and allows for a fair amount of movement (and stress) on the clip. The concept of having a thin strip of steel hanging off the side of your slide while firing also seems like it might lead to issues (getting your hand sliced open or altering the weapon’s cycling comes to mind). One final thing to think about when carrying IWB without a holster is the finish of your firearm. Without an extra layer of protection between the gun and your body, sweat and oils have the potential to expedite corrosion on the body-side of the slide and frame depending on material and finish. This isn’t my favorite style of carry (mainly for the sweat and exposed trigger issues), but it’s tough to beat the concealibilty of an (almost) zero-bulk CCW solution. If you are looking for a new way to carry concealed, this might be your answer. Discuss “clip carry” on The GunLink Forums and find TechnaClip online at technaclip.com. Hey, Emily. Thanks for coming over and commenting! I now see your trigger guards for the Ruger LCP and LC9, Glocks, and S&W Bodyguard at http://technaclip.com/index.php/accessories/trigger-guards.html. That would eliminate a lot of the safety issues that might be present on pistols that don’t have the long heavy DAO. Do you have guards for the Sig and XD pistols that just aren’t listed on the site, or are they still in the works. We are planning to offer trigger guards for all of our models, so yes they are in the works. We understand that the exposed trigger is a concern to some, so we want to offer the option for those who are interested in it. Let us know if you have any other questions. Thanks. If you carry your handgun on this clip, and you are sweating for some reason, will this affect your pistol’s reliability? I mean, it’s not too good to carry your gun right on your wet body. right?